Rated 5 out of 5 by Swampie from This generator is just what we need to keep our home and farm shop up and running. The value for the price is well worth the money. This generator is just what we need to keep our home and farm shop running when the power goes out, which is very often. The appearance is very neat and really makes our new home look outstanding. Rated 5 out of 5 by Sammy940 from Be totally prepared for power outages for days if necessary We happened to be hit by a tornado and while the entire neighborhood is totally pitch black our house was fully functioning. Kept pool pumps going during downpours of rain and saved our pool liner and auto cover. We went 4 days without power due to the damage and so many trees on the power lines. Never missed a beat and ran for 4 days. We were able to help our neighbors with water, charging, etc. Just got this RG045 installed due to our RG036 getting hit by lightning Sept 2018. Our peace of mind is back after several weeks of dreading thunderstorms or ice/snow storms. Highly recommended by our entire family for reliability and its auto transfer switch does all the work switching from Generator to Electric Company once the power supply is stable. Great value for the money. Rated 5 out of 5 by MLS from built to last this generator is outstanding. you never have to think about it. If your goal is to buy a generator that can easily power your house, without hesitation -pick this generator. 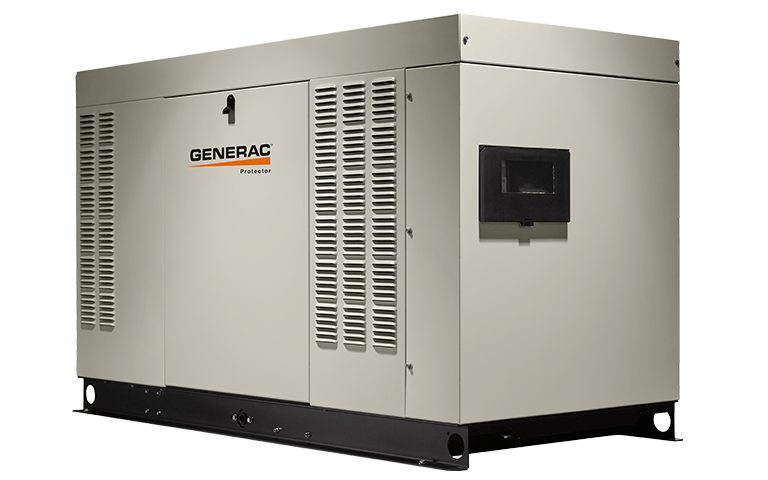 If your goal is to buy a well built generator that should last 10 years and work every single time the power goes out -pick this generator. In term of appearance, it looks like the picture. A nice, handsome generator. My suggestion is to put some bushes around it. I wouldn't make this magnificent monolith the centerpoint of your yard or anything like that. not sure why I have to grade appearance but it was one of the categories... I give this my highest recommendation. Rated 5 out of 5 by Oney from Several upgrades Good product. Good price. Good job We have a 45 kw for 10 years. The new one has several up grades. Rated 4 out of 5 by Darrett from Weekly Startup Error It has been great and I have used it five times already. One thing that gave me trouble was that it did not start on its weekly startup and through an error message. After that it did not start on the next power failure until we figured out how to clear the error message. The red light should have been on if it would not start on the next power failure. The light was green! We check the display every week after the weekly startup to make sure there are no error messages. Rated 5 out of 5 by Billy from This product is the best on the market... To say I was "skeptic" was an understatement but boy was I wrong. I had this generator installed in January of 2015 (after putting it off for over a year). This is the best investment I have made in concerning my home. The product works exactly as advertised, it is quite, and you don't miss a beat when you lose electric. Why I didn't have this installed sooner is beyond me. So glad I did as it has come in handy 5 times since we installed it and it worked perfectly. 45kW-RG045 is rated 4.9 out of 5 by 7. Maximize your investment and maintain your Generac home standby generator with a variety of accessories. The core of your generator system allowing you to safely connect a generator to your home's electrical circuits. Find parts online, shop for accessories, and buy maintenance kits for your Protector Series generator.